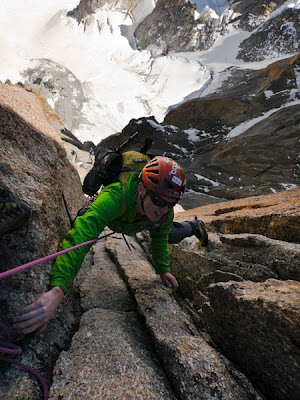 The Gervassuti pillar is one the most classic alpine routes in the Mont Blanc massif, and quite rightly so. Towering spires that are stacked upon each other to form impressive ridge lines, seems to be typical of the East face of the Tacul. Which gives a slightly overwhelming feeling once you are involved in its structure. 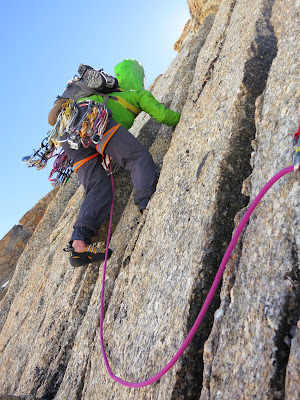 Ben Tibbets and I wanted to climb this route last week but due to someone sleeping in, not me, we decided not to go. Probably just as well as a storm came in that afternoon, and we don't like storms that much after the last time we climbed together. As Ben was only a little bit late this time round we managed to get on the 2nd lift of the day. Our original plan was to go from first bin, climb the route and try make it back for last bin down to town. We would have made it if we weren't 6 hours late! 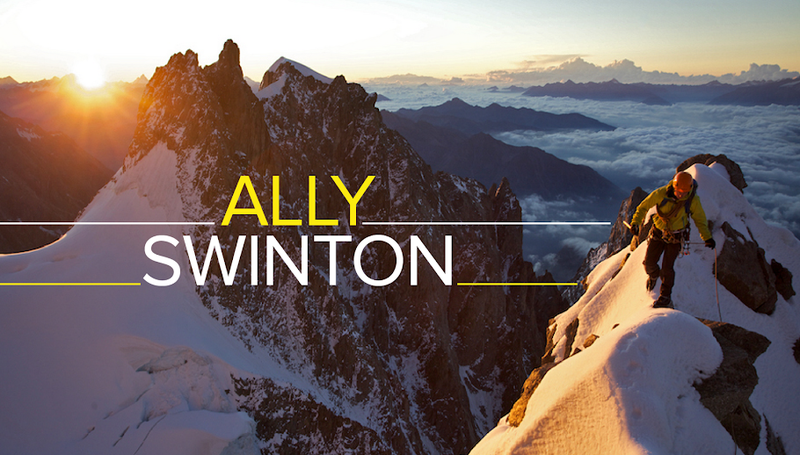 It has that classic mountain feeling of going on and on, kind of like being in the checkout at the local Super U. We jogged from midi to the bottom slope that takes you to the base of the route, which got us warmed up and I slightly regreted wearing my thermal bottoms! The start of the route has slightly changed as you used to start up to the right and then traverse in left. However since the glacier has receded so much, it is now really hard to do the original start. Not only this but it's right next to a gully which is very active with rock fall. The route now starts at the lowest point of the pillar, with a pleasant 6b crack to get you warmed up with. After this you stick mainly to the crest of the pillar for a few pitches then it weaves around a bit, going from one side to the other. The Aid pitch got the forearms warm and gave the thigh muscles a good stretch. The first few free climbing moves always feels a bit funny to me after doing a section of aid, just seems funny finding your balance on the rock again. 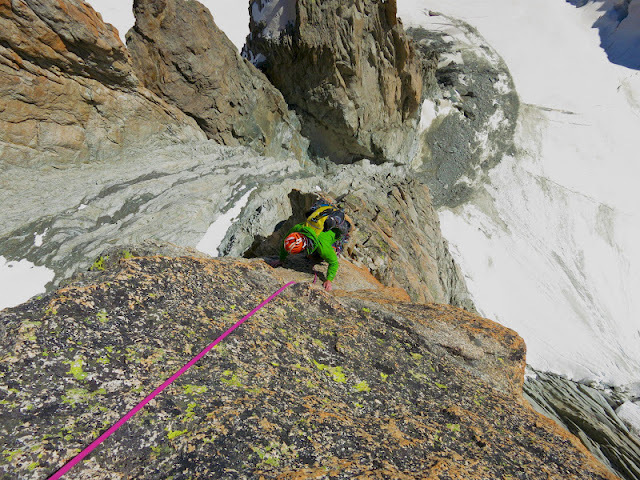 After we climbed the 70m groove we went out on the right to climb over snowy mixed terrain. Which looked so easy, but this part ate so much of our time. There was snow covering these rock slabs and blocks, which would be ok if it scraped off cleanly, but it left a lovely verglassed surface on everything! It took three pitches to get to the top of this section, and as it was my block I took these. 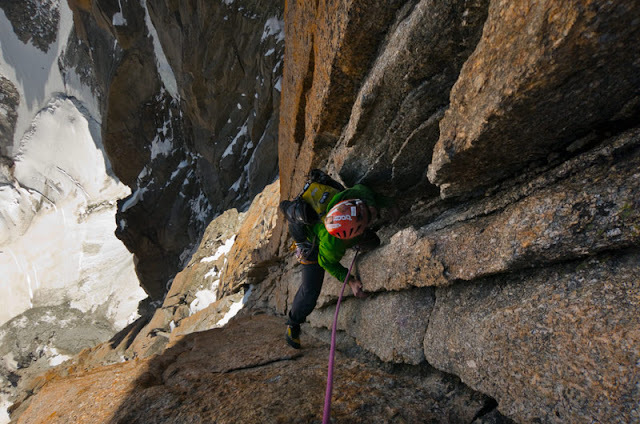 This is why I think climbing in blocks of pitches is good as after the leader has done their first pitch their head is into it and probably feel slightly more comfortable than the second. 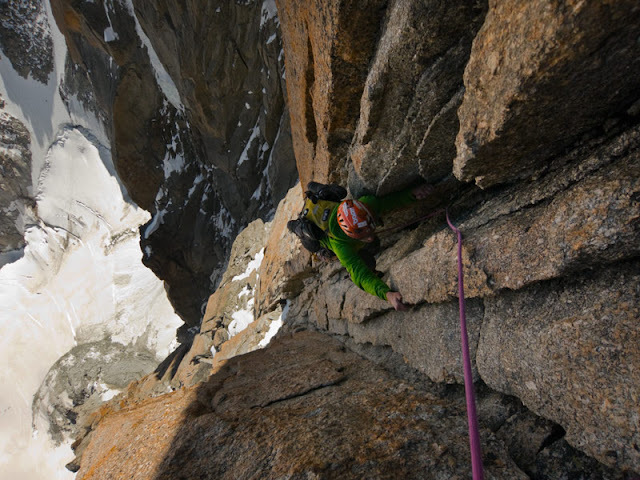 That's the main part of the pillar done when you climb these pitches. Then you have a short abb to the top of a small gully. You then climb a gully on the opposite wall from the abseil. Which at first you're sure you don't, but it's not as bad as it looks. When you top out from this pitch you instantly see the loose mixed terrain which is climbed for about 200m until you reach a wall. This loose area is really horrible and is made so much better when there's snow to hold it together. Really wouldn't want to be their if there wasn't. You climb the wall and head up and left to make your way to the final rock rib. By the time we got to the rock rib at the end, it was dark. So on went the head torches. It didn't take that long until I realised I should have put new batteries in my lamp! Climbing up the rock was slightly more awkward with no torch but it was made a bit easier with the 250 000 000 lumens of light coming from the moon. As I came to the last rock section I put my axe away down my back between me and my sac like the true Willy Wallace that I am...! However at the very end when you come to the snow slope which takes you to the summit, I took my bag off to get some food and stupidly forgot about my axe. Ting.....Ting...Ting.... Thanks to the bright orange sparks I knew when my axe was hitting the rocks as it fell into the Gervasutti couloir. As Ben managed to keep a hold of his axe he lead up the final slope and because I didn't know what it was going to be like I armed myself with my walking pole and nut key. This actually turned out to be both of our first time on top of Mt Blanc du Tacul, and what a way, day and night to summit it. I was actually quite happy that we took as long as we did on the route as it felt quite humbling to walk back to the Midi station in this gorgeous moonlit night. Even though we felt blessed seeing the mountains come to life from the Moon's glow, it was still horrendously bad walking back up the Midi arete! But dropping yer axe and forgetting to put new batteries in yer lamp.